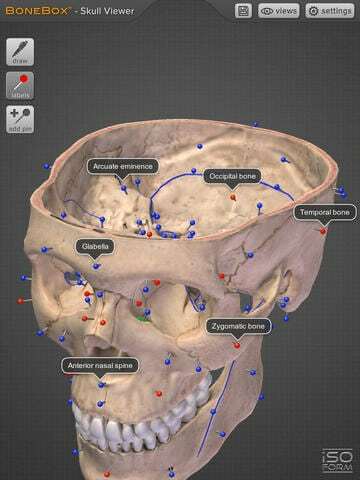 In this article, we are reviewing about an amazing Skull anatomy app that has gone for free today for the iPad only, Download it! The BoneBox™ Skull Viewer is compatible with the New iPad and the iPad 2. Due to the extremely high resolution models and textures, this app is not compatible with the first generation iPad. 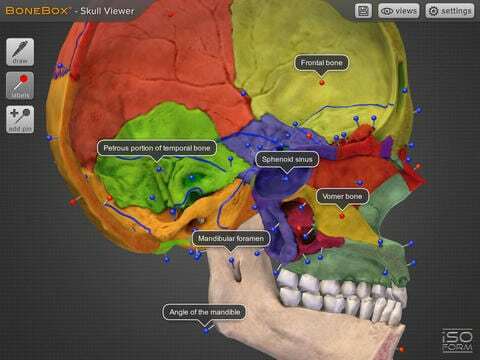 The BoneBox™ Skull Viewer is a real-time 3D medical education tool that features exceptionally detailed anatomical skull models and unique interactive elements. It is the first in a new series of apps developed specifically for the iPad 2 and the New iPad by a team of anatomists, certified medical illustrators, animators, and programmers using actual human CT imaging data, and cutting-edge 3D modeling techniques. Interaction with the BoneBox™ Skull Viewer utilizes true “real-time 3D”. Unlike other anatomical apps and programs, there are no pre-rendered frames or animations. Therefore, the user can orient the 3D skull in any position and zoom in to any location to explore anatomical structures. The BoneBox™ Skull Viewer is appropriate for users at all levels, from secondary students to medical professionals. Views: By selecting the “Views” menu he user can interact with sagittal, coronal, and transverse sections of the skull. Color-coded, didactic models clearly show the bones that comprise the skull. Pins: By turning on the color coded pins, the user can study the names and locations of over 100 anatomical structures, including: bones, foramina, and prominent anatomical features. The pins and labels remain on screen and in the exact anatomical location during all real time 3D user interaction. 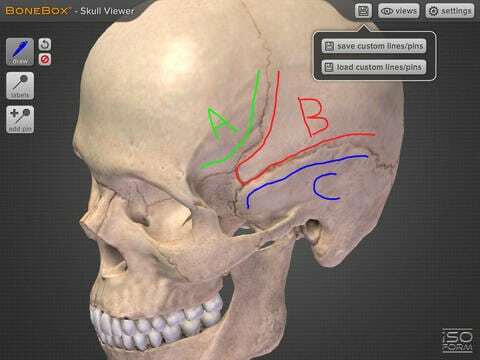 Pen tool: Drawing with the multi-colored pen tool allows the user to draw directly on the surface of the 3D skull for use in the clinic, or classroom. Quizzing: The BoneBox™ Skull Viewer an excellent tool for any anatomy lecture or lab. Using the custom pin tool, instructors can place color-coded pins anywhere on the skull. Once placed, the instructor can write a question on the label of that pin. Students can then rotate the skull in 3D to gain a better understanding of that pin’s location on the model. iSO-FORM is a team of award winning medical artists, programmers and innovators who believe that we are on the verge of a new era of learning, where the user doesn’t just memorize facts, but discovers them through engaging interaction and exploration. We’re passionate about science, technology and art, so we live and work at that intersection. If we’ve piqued your curiosity, check us out at: www.iso-form.com. 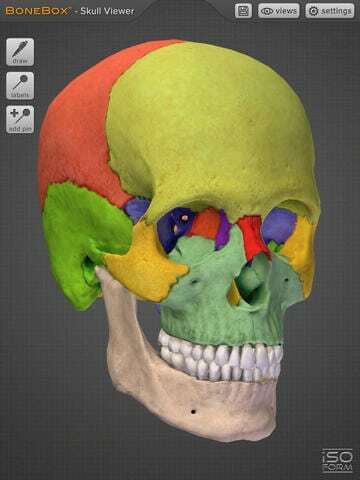 To be honest, I am writing this review, because I just download this app this morning and it was quite amazing and smooth animation it has most of the feature for basic head anatomy but very little in relation to the mandible or maxilla, nevertheless its still great reference to review the head for the exam and get a bearing about how the skull looks in a 3d view.